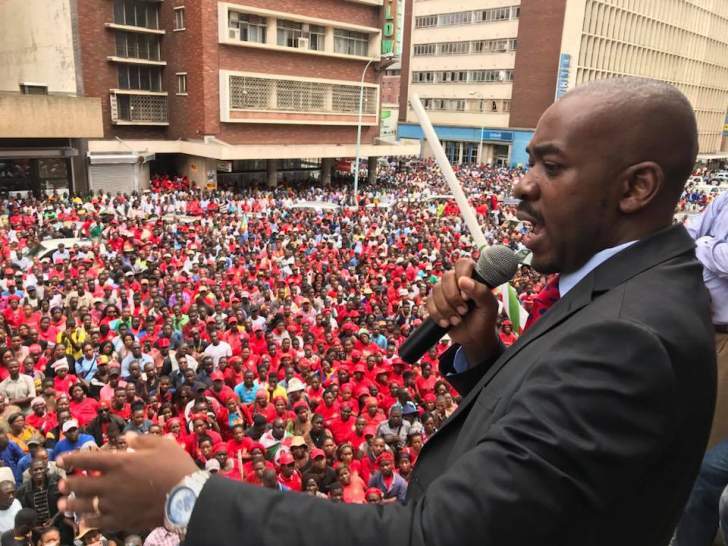 MDC Alliance presidential candidate, Nelson Chamisa has pledged to reverse successive Zanu PF governments' toxic politics centred on tribalism and "jobs for the boys" policy. Addressing a campaign rally in Victoria Falls yesterday, Chamisa claimed that his Zanu PF nemesis, President Emmerson Mnangagwa was no different from former President Robert Mugabe who picked Cabinet ministers and other top government officials along tribal lines. "My government will have no more than 15 ministers. We cannot have a rally of ministers or jobs for the boys. We will have ministers representing all regions of the country. "Those who were in government (former President Robert Mugabe) had 'Zezurunised' our government and the current ones (Mnangagwa) have 'Karanganised' our government. We want to see judges from the Tonga tribe. We must have the mosaic representation of our people across all governmental structures. I will de-Karanganise, de-Zezurunise and Zimbabwerise our government," he said. But, Zanu PF spokesperson and acting Information minister, Simon Khaya Moyo brushed aside Chamisa's claims as cheap politicking. "I don't know whether his facts are correct. The appointment of Cabinet ministers for example is the prerogative of the President. I don't know what he wanted, maybe we should have given him a position as a minister. It is not really clear how he arrived at that kind of conclusion. It does not make sense to me," Khaya Moyo said. Chamisa added that Mnangagwa was part of Mugabe's administration that failed the country, hence he could not be tasked to resolve the crisis. "We have no time to fight Mnangagwa because he belongs to the past. I doubt his capacity to turnaround the fortunes of this country. After 18 November (last year), he should have invited us to assist him govern the country. Mnangagwa is part of the past. "Mnangagwa and Zanu PF are ambassadors of poverty. We cannot have a new dispensation created by the old. Mugabe was assisted by Mnangagwa to wreck our country, so he must follow his master to rest," the youthful opposition leader said. Mnangagwa came to power last November on the back of a military intervention led by then Defence Forces Commander General Constantino Chiwenga that forced Mugabe into resignation. Chiwenga is now serving as Mnangagwa's deputy. "Chiwenga wants to rest in government. He should have left the army and gone into farming. They all fought for the independence of our country and they cannot be heroes of two struggles. "We want to take our country to the techno-level, its beyond Zanu PF, Mnangagwa and Chiwenga. Mnangagwa after August 1 will be the leader of the opposition and we will respect him as such," the opposition leader said. "We want to remove Mnangagwa because he got into power unprocedurally. Now Mnangagwa wants to get into power through the window using electoral tricks including mysterious ballots. There will be no election without an agreement on who is printing the ballot and where it is being printed." The opposition leader who fronts a coalition of seven parties warned that his government will not condone corruption. Introducing his party's aspiring councillors and MP, Chamisa said: "I am unlike (the late MDC-T leader Morgan) Tsvangirai who was tolerant and patient. I will fire you if you steal from the people. We want councillors who are out to serve the people, not to steal. If you are a sitting councillor and did some nefarious stuff, it must end now." He accused MDC-T faction leader, Thokozani Khupe, of seeking to "confuse our supporters." "We have a girl (Khupe) who failed to understand Tsvangirai's vision of an alliance, we went to court but realised our referees are biased so we changed and came up with the MDC Alliance. She is out to confuse our electorate but we are fighting her all the way," he charged. "So don't get lost on where you are going to vote, we are in the process of resolving the issue of name and logo. However, the problem is that where we want to resolve the issue they are taking sides with Khupe. So if crooks are working hand in hand, it makes it difficult and prolongs the process that is why we are educating our supporters homestead by homestead so that you vote on the right party, not MDC-T. Our logos are different , our MDC Alliance logo has my face in the open palm compared to that which has Tiki (baby), we are going around conscientising our supporters that we will be running under the banner of MDC Alliance, so don't be fooled or confused by their attempts," Chamisa said. He said he required at least two years to turnaround the country's stuttering economy. "We need two years to turnaround the fortunes of this country and create jobs. We want a new work ethic with 24-hour economic activity to cover the gaps left by Mugabe's government. Bond notes must go, we must adopt the South African rand and US dollar while waiting to reintroduce our own currency in the near future. Our people are losing a lot of money through mobile money transactions charges. We have all lost a lot of money to bank charges and we will correct that from August 1. We will create a rail-ring around the country so we can tap into domestic tourism," Chamisa said. "Public sector must be paid better than the private sector. We want to restore your dignity so that our people will want to move from the private sector to the public sector." Chamisa promised a truth and reconciliation process to "heal the nation" of dark chapters such as Gukurahundi, Murambatsvina and the economic implosion in which millions lost their pensions. "We cannot return the dead but we need truth telling to heal our country. We are not out for revenge but rehabilitative and restorative justice," said the former ICT minister in the Government of National Unity. Earlier, Chamisa had addressed another campaign rally in Hwange.